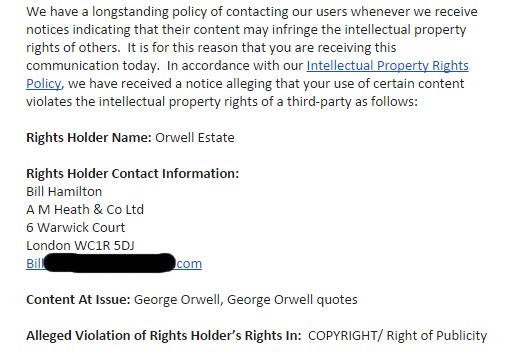 The Orwell estate appears to crack down on people who dare to use the number "1984" without permission. In a truly Orwellian move they have sent a takedown request, targeting an Internet radio host, for selling T-shirts that feature the four iconic numbers. 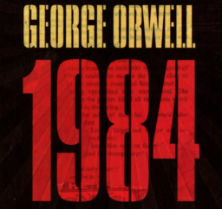 George Orwell’s Nineteen Eighty-Four is a classic book that describes a rather dystopian future with surveillance and control as central themes. The author himself passed away in 1950 and currently his rights are controlled and protected by the Orwell estate. Hadley is offended by the request which he believes to be illegitimate and something George Orwell himself would not support. “First off is the irony of the estate of George Orwell being all Orwellian but second is that you can’t copyright a number,” he tells TF. 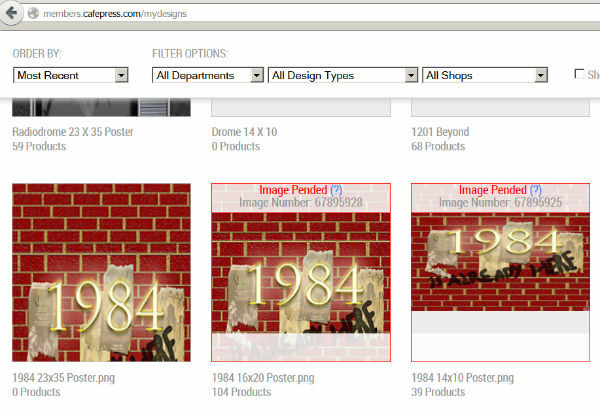 CafePress has pulled the designs offline and they are now listed as “pending” in Hadley’s dashboard. In theory, he could appeal the takedown but he has no plans to do so. The Orwell estate maintains that the use of the image violates their rights, according to its literary executor Bill Hamilton who we showed the contested design.